Our exclusive members-only resource Getting to Grips with Business Modelling will help you find out about how business modelling works, and to create a business model for your organisation. To become a member click here. Our members-only resource Getting to Grips with Financial Modelling will help you understand financial models. A financial model is a document which explains all the costs involved in your business model. It makes it really clear what key resources you put into delivering your model, and how much money they cost. To become a member click here. Cost: Free to enterprises successful in getting onto the programme. Type of support offered: Organisational Management and Development. Range of training, guidance papers, toolkits, publications, consultancy support re: organisational development, and peer support networks some free guidance but mostly reliant on joining as a member. Type of support offered: Organisation Management and Development. Links business volunteers with charities and advertises volunteer opportunities. Type of support offered: Puts teams of professionals together to support chosen charities with their development. Have to go through an application process. Type of support offered: Business Planning. Business modelling tool and support network. Cost: Free internet network and downloadable tool. Book and training charged. See website. Type of support offered: Business Development. Support social enterprises and charities to build effective relationships with corporate partners. Type of support offered: Organisational Management and Development. Toolkits and guidance around organisational development. Consultancy support. Cost: Some guidance can be downloaded for free. Other support is charged. See their website for details. Type of support offered: Organisational Management and Development. 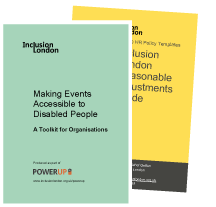 Downloadable policies and documents on a wide range of organisational issues. Type of support offered: Micro enterprise development. Support for people who want to set up micro-enterprises for care and support services for Disabled people. Free management consultancy for organisations whose primary focus is disability, social exclusion or poverty. Type of support offered: Organisational Management and Development-Training. Training courses and publications on all areas relating to voluntary sector. Access to fundraising databases. Cost: Charged. See their website. Type of support offered: Organisational Management and Development. Advice, guidance and templates for business development. Type of support offered: Business Development. Link charities with local business and professionals to help with wide range of organisational development. Work in Hackney, Newham and Tower Hamlets. Type of support offered: Organisational Management and Development. Training, consultancy, publications on lots of areas of organisational development. Cost: Some free (for registered members – charities with turnover below £1.5million can register) and some charged. Type of support offered: Organisational Management and Development. Advice, blogs, discussions, how to guides on all sorts of issues relevant to the voluntary sector and organisational/professional development. Type of support offered: Organisational Management and Development. Online resources and info sharing on all aspects of not for profit organiasations. Type of support offered: Organisational Management and Development. Advice, guidance and templates for organisational and business development. Type of support offered: Community development. Advice, guidance and some funding support for communities to take control of services, development etc, in their neighbourhoods. Type of support offered: Strategic and Business Planning. Coaching support for one year (three hours per month) to charities and social enterprises with income less than £3million by four professionals from the business sector matched to your organisation. They aim to support organisations in developing robust strategic and business plans – with outcomes of increased income, increased beneficiaries and improvements in business skills such as analysis and planning, fundraising and financial management, staff and trustee performance, communications and measurement. Cost: Free to successful applicants. Type of support offered: Social enterprise development. Courses and workshops about social enterprise development, or moving charities towards trading. Cost: Some free, some charged. See website for details. Type of support offered: Organisational Management and Development. Regular bulletins to members, advice online, free training, skills sharing and mentoring service, trustee finding service. Cost: Free to organisations with income below £1million. Type of support offered: Organisational development. Scaling up social enterprise. Support and sometimes financial investment in charities or CICs with income over 1.5 million and significant proportion of earned income, with minimum of 1000 users per year. Type of support offered: Organisational Management and Development. Research publications, and sometimes support programmes in specific service delivery fields – see website. Type of support offered: Governance. Membership organisation for Chairs. Events, networks, resources. Type of support offered: Governance Development. Consultancy Support for governance development. Type of support offered: Governance Forum for Treasurers. Guidance and events. Cost: Free memberships. Resources and events charged. Type of support offered: General. Trustee recruitment. Mentoring. Regular bulletins to members, advice online, free training, skills sharing and mentoring service, trustee finding service. Type of support offered: Evidencing need. Monthly e-bulletin with data about Londoner’s issues, for example employment stats updates. Sample bulletin here. Type of support offered: Impact measurement and monetising social value. Link economists to charities to advise and support on impact measurement and monetising value. Long term support (usually at least a year).